Guadalupe bass (Micropterus treculli) are the Texas State Fish, and they’re just made for tenkara. If you live in the Texas Hill Country, or are able to visit the area, I’d encourage you to give them a try. 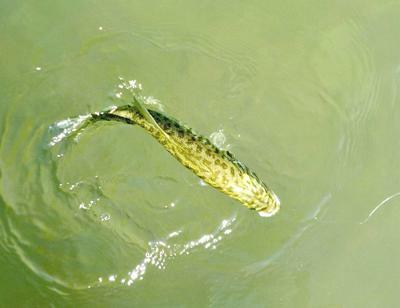 They don’t grow big (the state record is under 4 pounds), but they’re tenacious fighters on light gear. 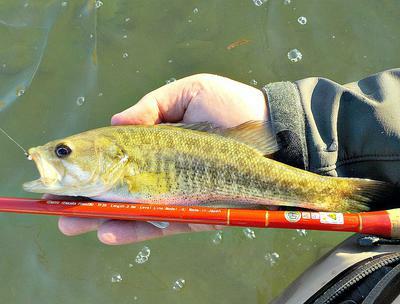 The average Guadalupe bass is probably only 8-10 inches long, but what fun on a one-ounce rod! They jump and run for all they are worth. I’ve had good luck catching them on the Blanco, Guadalupe, and South Llano Rivers, plus the tributaries and drainages at Lost Maples State Natural Area. 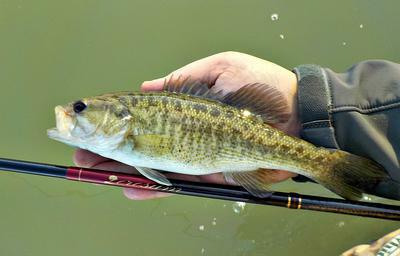 In fact, Lost Maples is a designated nursery area for them, and all bass fishing is strictly catch-and-release. Guadalupe bass can be fussy and finicky, however, so I thought I’d pass along three suggestions that I’ve learned over the years. First, know their habitat. I catch largemouth bass and Guadalupe bass in the same rivers but not in the same places. Guadalupe bass favor faster moving water, often stalking the seams of stronger currents. Yes, you’ll catch them in other spots, but the feeding lanes near faster water are their favorite hangouts when they’re actively feeding. Often, I’ll see them in slower pools, but they’re just not biting there. Second, practice stealth. Guadalupe bass may not flee if you disturb their water, but they will close their mouths. They’re shy by nature and easily alerted to any intrusion. When I’m fishing for them, I move quietly, watch my shadow, wear drab clothes, and cast gently. I try to make sure that my fly lands first. Third, movement of the fly triggers strikes. More than any other fish I know, Guadalupe bass respond to a lure that moves quickly through the water column. I catch many fish using a dead drift, but I almost never catch Guadalupe bass that way. Instead, 90% of them are taken on my tenkara gear when I bounce either a nymph or live bait along the bottom and then raise it quickly to prepare for another cast. I catch many of them on Gold-ribbed Hare’s Ear Nymphs and Utah Killer Bugs, but it’s almost always when I’m ready to lift the fly for the next cast. Maybe it’s the way I fish, or maybe it’s built into these fish, but that’s my experience. 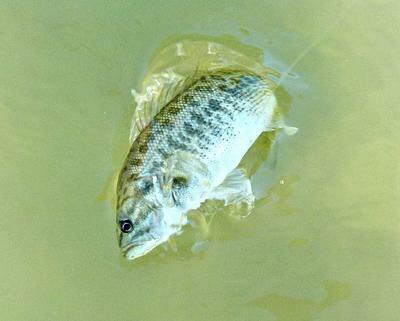 It occurs to me that the three tips above are effective for other species besides Guadalupe bass. Give these suggestions a try and see if they work for you. Great article John. I had a business trip to Austin in 2017. Thanks to John I had 3 options for fishing while in Texas. Two of those waters had Guadalupe Bass in them. I only fished two of the waters, one had the Guadalupe bass present. I didn't catch one, but I did have one follow my bait so I got a very good look! About like in the second picture! The good news is that in both streams I fished, I caught many many panfish. You can fish in the State Parks for the price of admission to the park without an out of state license in Texas. I fished in late June, and the water was nice and warm. It was fun wading wet. It is so easy to take a Tenkara rod or two and a small selection of flies and have a great time on the steams in the Texas State Parks. One think I love to do is pack my Zimmerbuilt Tenkara Sling Lite, and put it in the bottom of my carry-on suitcase, and I am all set! This summer I have to go to Chicago, I am hoping for a day in Wisconsin in the Driftless area. Yes it is worth the drive!